Mahalo for your submission and all of your support! 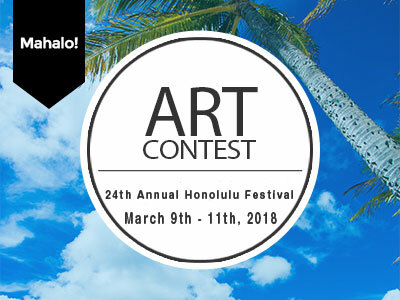 The 24th Honolulu Festival Art Contest called for entries in August 2017. This contest was open to all the residents of Hawaii, including students. 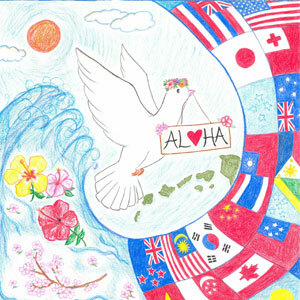 Each artwork was required to incorporate the main theme of the Honolulu Festival “Pacific Harmony” and this year’s sub-theme “Harmony over the Ocean, Journey to Peace”. We received a total of 81 submissions, and they were put into a vote through our Facebook page and judged by the members of the Honolulu Festival Committee. We are pleased to announce the following five winners! As this year’s Official Artist, Akemi Santiago’s artwork will be featured on our poster, flyer and official guide book. All the winners’ artwork will be displayed at the Hawaii Convention Center throughout the Honolulu Festival. Please come to see their amazing art! 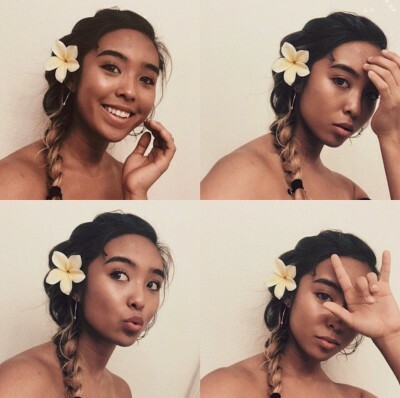 Born and raised in Kaneohe, Oahu, Akemi is a high school senior at Hawaii Baptist Academy with a love for painting, adventuring, fashion, learning, and exploring her diverse cultural background. Aside from her rigorous academic life filled with AP classes, she enjoys hanging out with friends, eating good food, and listening to good music. Despite her choice to not pursue art as an initial college major, she plans on continuing to incorporate her creativity into her everyday tasks and continuing to paint as a way to relax and unwind. As a potential nursing major, she hopes to learn about and observe things in her career path that can serve as inspiration to create new art. Also on her future agenda is to continue learning about her ethnic background and the beautiful traditions and culture of Hawaii. Each person in my piece represents a different Pacific culture. Harmony over the Pacific is represented by making each person a part of the ocean or surrounding landscapes. The hula dancer makes up the water, the Japanese woman’s umbrella represents the sun, and the two surrounding women represent several land masses in the ocean. Each culture plays an equal part in making up the Pacific. The hula girl is presenting a flower to the other cultures signifying a journey to peace. The hula girl is holding the flower because the event is hosted in Hawaii. 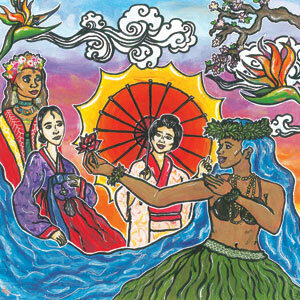 This colorful artwork beautifully represents the 24th Honolulu Festival’s sub-theme “Harmony over the Ocean, Journey to Peace,” and the people of Hawaii, Japan and all over the Pan-Pacific. The artwork depicts the encounter of people from diverse cultures taking place here in Hawaii, the center of the Pacific. Their hope for peace as seen in their eyes left a big impression. Born and raised in Hawaii, Jennifer Takahashi recently graduated from the University of Hawaii at Mānoa with a focus in Communication and Japanese. 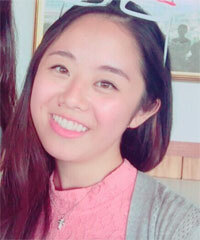 As her mother is from Japan, she always had a strong love for Japan and hopes to visit Japan soon! She also has an interest in the arts—whether it be acting, singing, ordrawing. She currently works at a Japanese travel agency and is excited to be reminded of Japan every day and at the same time, be able to continue her art after graduating. She loves to go to church, read books, travel, and eat delicious foods! When constructing this piece, I really wanted to incorporate the idea of “Aloha” and that all of the countries of the Pacific Rim are distinct but connected. I drew a dove in the center, a symbol of peace and purity, with a traditional Hawaiian haku lei. This dove is bringing the spirit of “Aloha”—love and kindness—all over the Pacific. The many beautiful flags of the Pacific Rim are drawn side by side and merge into a united wave signifying the Pacific waters that bring them together. The flags and the symbolic multi-colored hibiscuses of Hawaii as well as the sakura (cherry blossoms) of Japan show the uniqueness and beauty of each country. 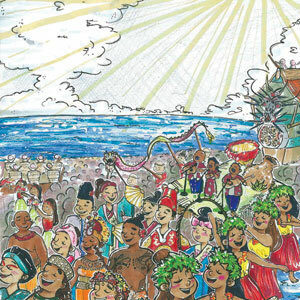 We are all under the same brilliant sun and are all celebrated at the Honolulu Festival. The dove looks toward the future as we continue on this journey to peace. A pigeon, the symbol of peace, has brought the message of ALOHA across the ocean to Hawaii. This artwork is nicely drawn with flags of various countries in the Pan-Pacific region, and it conveys the importance of world peace with beautiful flowers. This is an excellent piece that warms up people’s heart. In this piece, I captured the many various cultures along the Pacific Rim marching in togetherness as a lively parade. I tried to use a lot of colors, patterns, and fine details to employ individuality throughout each marcher. When looking close, one may see the details that make the marchers appear different. However, when looking at the picture as a whole, one can see a unified group. Though there are many diverse cultures that make up our state, through pride and the aloha spirit, each adds to the uniqueness Hawaiʻi has to offer. When others look at my piece, I hope they feel proud of their cultural and ethnic backgrounds. In addition, I hope that others can not only acknowledge the unity of Hawaiʻi, but also appreciate our differences. March on! 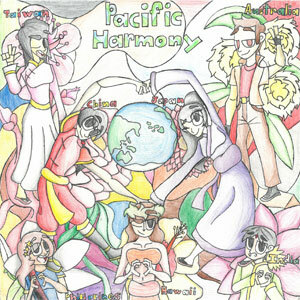 I wanted to show and represent the harmony and the peace between the many pacific nations through my artwork. The heart surrounding the planet earth, represent the harmony itself that keeps the world balanced. The flowers behind the personified nations are to represent the life that “blossoms” inside of their country, that the flowers are full of life. Though sometimes, I’d rather have the viewer to make up their own description, to use their own imagination and create something new like me. Just like art, our world can mean more than it should. 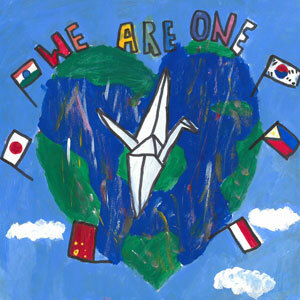 My art piece is about harmony over the oceans, and through the land.There is a crane flying over to represent peace. There are fireworks in celebration of new friendships and harmony. The flags represent all the amazing places and people over the Pacific.